Much of the work over the last year has focused on the removal of invasive and/or aggressive plants along the Copper Slough. The work initially focused on the removal of honeysuckle, autumn olive, multiflora rose, and willow. This was followed by a big initiative to remove poison hemlock and, as the season progressed, giant Ragweed. 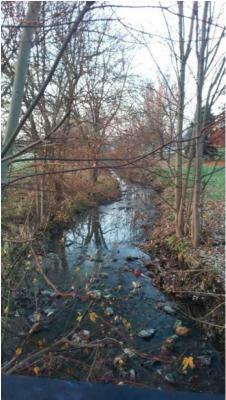 Last year, none of the multiflora rose, autumn olive, honeysuckle, or poison hemlock set seed along the stream corridor from Bradley Avenue south to the bridge. Of those species, only the poison hemlock should require major efforts to control along the stream over the coming year. My hope is to remove the rosettes early in the season, continue to exhaust their remaining seed bank and encourage the growth of native species. Giant ragweed likewise will require major efforts again this year. Hopefully, we can get them out while they are still small and, ideally, deplete their existing seed bank over the course of the summer. Other species of concern along the stream have included minor infestations of Star of Bethlehem, teasel, Canada thistle, and crowned vetch. All seemed to be under control at the close of last year's season. My earliest work at Heritage in the fall of 2015 focused primarily on the area originally designated organic at the south end of the prairie. In the first few months, I removed over 300 callery pear trees in addition to clearing a large patch of crowned vetch. The area cleared from crowned vetch and callery pear removal was replanted with a seed mixture provided by Bruce Stikkers of Pheasants Forever. It filled in very nicely. Because both crowned vetch and callery pear respond to burns with aggressive growth, I asked that we wait and get these species under control prior to burning. Hopefully, that area can be scheduled for burning in the fall of 2017. Plans for the coming year include monitoring the area and removing any remaining crowned vetch and callery pear, getting an earlier start for ragweed removal, thinning/removing much of the common goldenrod, and keeping the poison hemlock and wild parsnip under control. While the Dodds Park area is beset by infestations of a number of aggressive, invasive, and unwanted species, it is very rich in wildlife of all kinds: many, many species of birds, crawfish and other aquatic life, but most particularly, insects. A few days before the Fecon mower came through, I walked the entire stream through Dodds Park to Parkland. The whole area was alive with insect life. Swarms of insects were everywhere along the entire stream corridor. While I haven't been closely following the movement to promote pollinators, it has occurred to me since that what we have there may potentially be the county's largest pollinator pocket. Keeping and clearing litter out of the Copper Slough appears to be one of the area's biggest challenges. While there may be some littering and dumping in the park itself, its been my impression that much of it is blown in from around the city. I contacted David Oliver a year ago about potentially organizing regular cleanups of the surrounding areas through the Keep Champaign Beautiful Program. At the time, he was focused on the Boneyard Cleanup and too immediately preoccupied to do any long term planning. Perhaps this is something we could work on this year after the Boneyard Cleanup is finished. Three people besides myself have expressed an interest in stewardship at Heritage Park. Leslie Penner has been coming on her own to pick up litter throughout the park. Creel Lancaster has come to most workdays and been involved with removal of invasive species along the slough for more than a year. Julie Niesset of UIUC's Wetland Ecology Group at the Prairie Research Institute has also expressed an interest in being involved with planting and restoration along the stream corridor. One of the most amazing aspects of working along the Copper Slough has been the opportunity to observe the area's rich populations of wildlife. While its hard to imagine the Dodds, Heritage, Kaufman corridor as serving an important role as an urban wildlife refuge in southwest Champaign, it very much appears to be filling that function in our community. A few of the species that have been observed there include muskrats, mink, coyotes, herons (blue, green, and crowned), redtailed hawks, and mallards. To the extent that food and habitat for wildlife is an important goal of any conservation efforts, it is hoped that future developments will allow the area to continue serving this important function. As HIPP and its member organizations continue to make inroads on educating about and eradicating invasive species within our communities, the need to work with others across property boundaries becomes more evident. For optimum effectiveness, we will need to work closely with Parkland, the city of Champaign, and adjacent landowners. Its also to be hoped that the focus will expand to embrace the larger issues of ecology and the broader perspectives from which the health of our environment can be enhanced. Over the last year, I have served on the Urbana Natural Areas Committee. As I understand its function, it serves as a citizen's advisory, with a two-way flow of information. It would be wonderful if the Champaign Park District had something similar. These photos were taken at Heritage Park along the Copper Slough. One of the things that excites me most about doing restorations is finding plants like these that nobody planted, but somehow or other just found their way back home spontaneously as the invasive species were removed. Editor's note: If you're like me, you're inspired by Elizabeth Kirby's amazing energy and commitment to our natural world. This story comes from her report to the MN board about her past work and upcoming projects. Hope you will join Elizabeth on one of her many workdays!